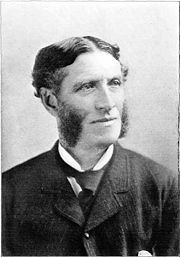 Matthew Arnold (December 24, 1822 – April 15, 1888) was an English poet and critic of the Victorian age. He is often remembered as the third greatest poet of his generation, behind Alfred Lord Tennyson and Robert Browning. Arnold himself was aware that, though a talented poet, he was not the great poet of his age, and at the height of his career he abandoned poetry entirely, turning instead to writing literary criticism. This shift in focus would be fortuitous not only for Arnold, but the field of literary criticism as well. He is often considered to be the founding father of academic criticism in English, and the principles for literary criticism which he advanced—objectivity, attention to detail, and an exclusive focus on the poem rather than the poet—would become the foundation for professional literary criticism, setting the stage for the rise of Formalist criticism in universities and colleges the world over. Arnold was also a major cultural critic, and his views on the moral degeneration of his times are often seen today as strikingly prescient. During a time when general optimism reigned, and poets could write, without irony, such lines as "God's in, his heaven—/All's right with the world!" Arnold sounded a rather dour note of concern over the direction in which his society and Western society in general, was moving. He became a vigorous defender of "high culture" and classic literary education when such institutions were rapidly crumbling in the face of changing times; and, although his views on culture remain controversial, it is undeniable that his work in cultural criticism was directly responsible for reinvigorating literary and artistic scholarship in the nineteenth century. Matthew Arnold was born in Laleham, Middlesex. He attended Rugby School in London, a school run by his father, Thomas Arnold. When he was of age he went on to Balliol College, Oxford, becoming a Fellow of Oriel College, Oxford, in 1845. Thereafter he was private secretary to Lord Lansdowne, Lord President of the Council, through whose influence he was appointed as school inspector in 1851. Arnold would remain a school inspector all his life, traveling widely over Britain and even the European continent, and writing extensively on the state of British education. In 1849, he had published his first book of poetry, The Strayed Reveller, which he soon withdrew: Some of the poems, however, including "Mycerinus" and "The Forsaken Merman," were afterward republished, and the same applies to his next book, Empedocles on Etna (1852), with "Tristram and Iseult." He was later appointed Professor of Poetry at Oxford, an honor which did not pay much, but must have been a vindication. Arnold had never been a star pupil when he was a student at Oxford, though he loved the institution, and had struggled to make his artistic mark as a poet. In 1883, Arnold was able to retire and devote himself to literature, receiving a pension of £250. Never fully free from financial troubles (including his son's gambling debts), he left the same year for a lecture tour of America. There his daughter would fall in love and marry an American. Five years later, when racing to meet his daughter and new granddaughter, he would suffer a fatal heart attack. He is buried in All Saints' Churchyard, Laleham, Middlesex. Arnold wrote during the Victorian period of English literature roughly spanning the mid-nineteenth to early twentieth centuries. He is sometimes called the third great Victorian poet, behind Alfred Lord Tennyson and Robert Browning. Arnold himself was keenly aware of his place in poetry, and in an 1869 letter to his mother, discussed the merits of his work and his two more famous peers: "My poems represent, on the whole, the main movement of mind of the last quarter of a century, and thus they will probably have their day as people become conscious to themselves of what that movement of mind is, and interested in the literary productions which reflect it. It might be fairly urged that I have less poetic sentiment than Tennyson, and less intellectual vigor and abundance than Browning. Yet because I have more perhaps of a fusion of the two than either of them, and have more regularly applied that fusion to the main line of modern development, I am likely enough to have my turn, as they have had theirs." Some consider Arnold to be a bridge between Romanticism and Modernism. His use of symbolic landscapes was typical of the Romantic era, while his pessimistic opinions of the future were typical of the Modern era. His tendency towards pure rationalism—going so far as to suggest that poetry would one day take the place of religion—offended some of his readers. He has come under criticism for this rationalist tendency in his poetry. His talents as a poet in general have also been criticized, with some authors criticizing his poetry for being overly sentimental and lacking in power. Nonetheless, as a poet, he undoubtedly exercised a stimulating influence on his time; he was very popular, and widely read; and his writings are characterized by the finest culture, high purpose, and sincerity. Though Arnold's preoccupation with the world of ideas and high culture may at times take the spark out of his poetic fire, he nonetheless is a poet to be reckoned with. Henry James, a close contemporary and friend, wrote quite aptly that Matthew Arnold's poetry will appeal to those who "like their pleasures rare." Although Arnold's poetry received only mixed reviews and attention during his lifetime, his forays into literary criticism were much more successful. Arnold is famous for introducing a methodology of literary criticism through his Essays in Criticism (1865, 1888), which influence critics to this day. Arnold believed that literary criticism should be treated objectively, and that objective principles for the study of poetry could be devised by scholars with the fortitude to treat literary analysis with the same sort of scrutiny and discipline found in the natural sciences. Arnold's influence on literary criticism is immense; some have argued he is the most important literary critic of the nineteenth century. Arnold, however, was not only a critic of literature. His early criticism on poetry expanded into a general critique of the culture of his age. Between 1867 and 1869, he wrote Culture and Anarchy, which would become his most famous work of cultural criticism, and one of the most influential statements of the zeitgeist of the Victorian age. In Culture and Anarchy Arnold argued for a classical education in the great works of literature and art, to instill a sense of culture and virtue in a population that was rapidly tending towards "anarchy," Arnold's term for undisciplined democracy. Culture and Anarchy is also quite famous for Arnold's division of the British populace into three broad categories: The "Barbarians," the noble working-classes who are good at heart but ignorant of ideas; the "Populace," the middle-classes, who in Arnold's words are "still raw and blind;" and the "Philistines," the landed, educated classes, full of moral ideas and the will to act, but who are lacking in "sweetness and light." Arnold's thesis—which is perhaps the most general statement of his thoughts on culture and poetry in general—is that the "Philistine" class is the key to all moral societies, for only they can make serious social change, and that the function of literature, and culture at large, is to inculcate the philistines with virtue, with the "sweetness and light" of the true, the just, and the good. Poems (1853), containing "Sohrab and Rustum," and "The Scholar Gipsy"
Poems, 2nd Series (1855), containing "Balder Dead"
New Poems (1867), containing "Thyrsis," "A Southern Night," "Rugby Chapel," and "The Weary Titan"
He also wrote many works on the state of education in Britain and Europe, but these works are not included here for the purposes of concision. Trilling, Lionel. Matthew Arnold. New York: Norton, 1939. Muller, Jerry Z. The Mind and the Market: Capitalism in Western Thought. Anchor Books, 2002. Works by Matthew Arnold. Project Gutenberg. Poetry of Matthew Arnold at Poetseers. Matthew Arnold, by G. W. E. Russell, at Project Gutenberg. The Letters of Matthew Arnold Digital Edition, at the University of Virginia Press. Why Matthew Arnold's Culture and Anarchy is a morally repugnant work Lincoln Allison, University of Warwick. Profile page for Matthew Arnold on the Find-A-Grave web site. This page was last modified on 1 September 2018, at 14:46.